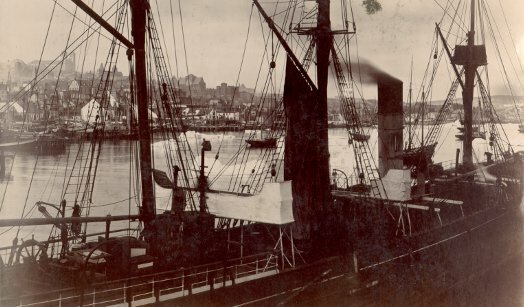 St John’s Harbour c. 1905 Job Photograph Collection Reproduced by courtesy of the Maritime History Archive. The Maritime Studies Research Unit [MSRU] is a research unit within the Faculty of Humanities and Social Sciences of Memorial University. It fosters research on maritime topics across the University. Members are involved in the interpretation of human behaviour in marine and coastal environments, both in the past and the present. The Unit emphasizes interdisciplinary work and provides opportunities for Memorial faculty and students and visiting scholars to present their research in workshops and colloquia and as individual paper presentations. The Unit’s occasional activities have recently involved schools, family history societies and environmental organizations. Membership in the MSRU is open to faculty and staff of Memorial University with research interests in maritime studies. Graduate students attached to any unit at Memorial are eligible for membership as associates of the MSRU. Scholars sharing these interests at other institutions are also eligible for associate membership. The Chair of the MSRU, Valerie Burton, welcomes enquiries from individuals interested in the Unit’s activities and in joining it or in contacting any of its researchers. Please email her at vburton@mun.ca. The Unit’s forthcoming events are advertised on the notice-board below. Profiles of the members, including more detailed accounts of their specializations, follow.